Kiosk Pro allows you to export the app settings as an XML file, which can then be transferred to another iPad and used to update the Kiosk Pro settings on that device. You'll need to be able to connect your iPads to a computer with iTunes, or have a Mail account set up on your iPad. Open the Kiosk Pro settings on the iPad that is correctly configured. Scroll down to the Remote Settings Control category and select Export. Select "Export to file" or "Send by email" from the navigation. A file called "settings.xml" will be created in the Kiosk Pro documents folder on the iPad, which you can transfer via iTunes. If you chose "Send by email", a window will appear allowing you to create an email, and the file will be deleted from the documents folder after being sent. Note: If there's a passcode set in these Kiosk Pro settings (near the top of the settings menu) please make sure you know what it is before following the rest of these steps. Alternately, you could delete the passcode before exporting the settings. Connect your iPad to a computer and open iTunes. Access your device by clicking the 'iPad' or 'iPhone' button that appears at the top left of the screen. In the left sidebar that appears, click 'Apps'. 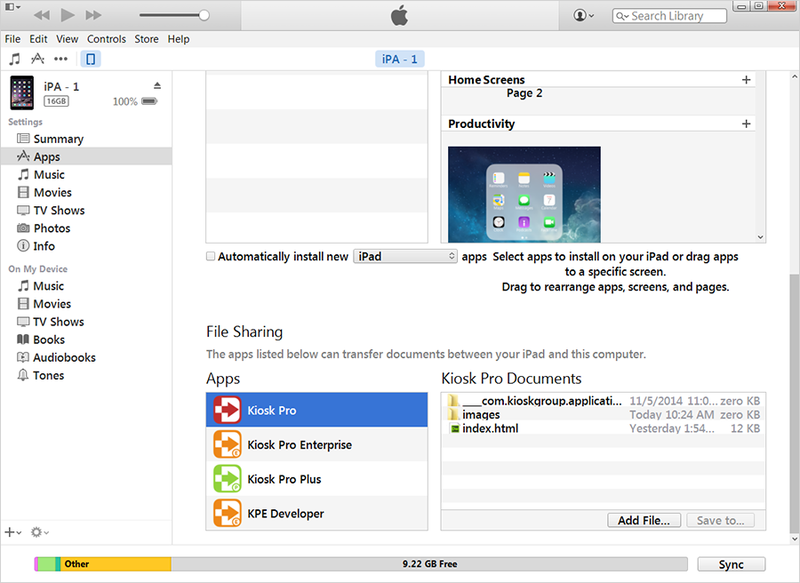 Scroll down to 'File Sharing' and click on the version of Kiosk Pro you are using. Select 'settings.xml' and click 'Save to...' at the bottom of the file listings to save this to your computer. After you've saved the file to your computer, you'll want to plug in your other iPad and repeat steps 1-4 of these instructions. Then, you can click 'Add File...' and select the 'settings.xml' file. You can also drag and drop from the file browser window. Open the Kiosk Pro settings on the new iPad. Scroll down to the Remote Settings Control category. Enter "settings.xml" into the XML File Location setting. Select Run Kiosk Presentation and your settings will update.